By phone and written word. We support local schools in the district giving talks, supporting staff and students and offering training. Operating in Wakefield Prison and New Hall Prison, our team supports listeners in prisons and offers support. We accept face to face callers at the branch and support face to face at collections, during outreach and at other events. Wheelchair available on site, ramps and stairlift for volunteers requiring access arrangements. 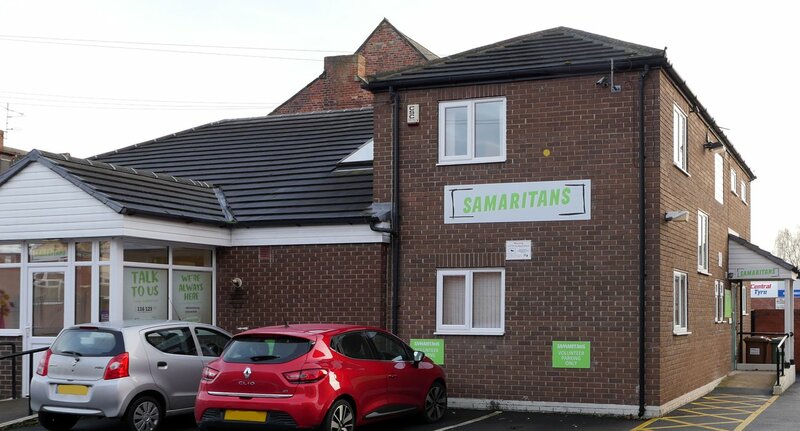 The Samaritans of Wakefield and district have been working to provide support to our community since 1971! We are always looking for new volunteers and would love to hear from you! Though previously based on George Street we are still going strong at Charlotte Street with over 100 volunteers helping us to support those who need us. Samaritans provide confidential, non-judgemental support 24 hours a day for people who are experiencing feelings of distress or despair, including those which could lead to suicide. Could you volunteer with us?- we are looking for listening volunteers, written word volunteers, fundraisers and shop volunteers. Whatever your skills, we welcome you. Donate to us! - We're always in need of donations to support the work we do! For more information on donating see our donations page. Need support? Find all our information on this page. If you want to know what to expect if you call us, this page may help.